Time Standards and Swim Meets - What does it all mean? One of the most challenging things for parents of new swimmers can be to understand the time standards for competition. In San Diego, there are three levels of time standards: B, A and Junior Olympic (JO). These can be found on the SI Swimming website. Swimmers who have never done an event and do not have a time (NT) are considered a C swimmer, or slower than B. Once a swimmer achieves a B time standard, they qualify for any meet marked as AB or B minimum. Once a swimmer achieves an A time, they qualify for a meet marked as A or A minimum. Junior Olympic time standards are separate from the A/B time standards and are usually faster. These time standards are used to qualify swimmers for JO’s, which are held in February at the end of short course season, and July, at the end of long course season. There are two sets of time standards for the JO meets, as they are held in two different courses. The short course time standards are for all events done in a short course yards pool (25 yards long). The long course time standards are for all events held in a long course meters pool (50 meters long, or Olympic length). You cannot use a short course yards time to qualify for a long course meter event! This is just an introduction to time standards, as there are many more used throughout the swimming world. Many meets have their own set of standards, such as Nationals or Olympic Trials. Swimmers and parents should use time standards as a guide and as goals throughout the swimmers career, but never as an absolute definition of how successful they are. 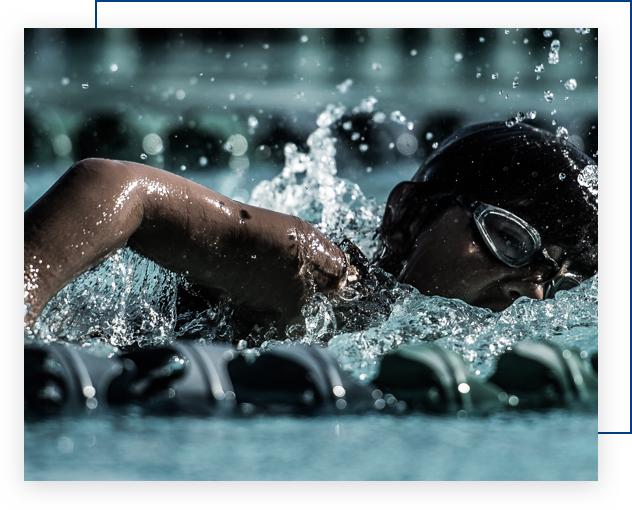 You can find a list of upcoming swim meets for our swimmers under MEMBERS >> CALENDARS >> MEET SCHEDULES on the main menu or by clicking here.